The 8 Series was BMW’s glorious halo car when it originally came out in 1989. With the new revival of the 8 Series nameplate, BMW wants to one-up its own ostentatious halo car by making an M8. Best of all, they’re also developing a M8 GTE endurance race car to take to the 24 Hours of Le Mans. Bless you, M division. This is exactly what the fancy people need. 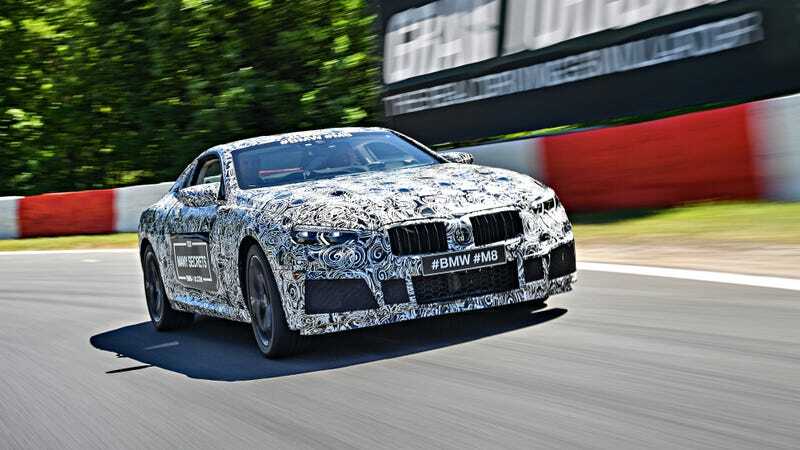 This work-in-progress camouflaged M8 pre-production prototype was shown off ahead of the the Nürburgring 24 Hours this weekend. Under all the swirlies, you can see a few standard track- and hoon-oriented M features, such as upgraded brakes, larger air intakes and a four-tailpipe sport exhaust. BMW M president Frank van Meel said in today’s announcement that development of the M8 is happening right alongside the development of the standard 8 Series. While BMW didn’t release any specs in their announcement, BMWblog speculates that the M8 may get either the 4.4-liter twin-turbo S63 V8 from the F90 BMW M5 or the 6.6-liter twin-turbocharged V12 from the BMW M760i—both of which produce around 600 hp. Meanwhile, BMW’s Motorsport division is working on a BMW M8 GTE race car to take to Le Mans, which finally answers the question of what they plan to race in their return there. Motorsport director Jens Marquardt says the program is “in full swing” despite there being no photos of their GTE-class endurance racer that they’re willing to show off yet. The M8 GTE will be rolled out later in the first half of 2017, and BMW plans to debut the car at the 24 Hours of Daytona in January 2018. In the meantime, here’s the rad car the M8 GTE endurance racer will be based on. We can’t help but to agree with the side of the car: too many secrets! If you’ve seen an uncovered version of either the BMW M8 or the M8 GTE, drop us a line: tips@jalopnik.com.